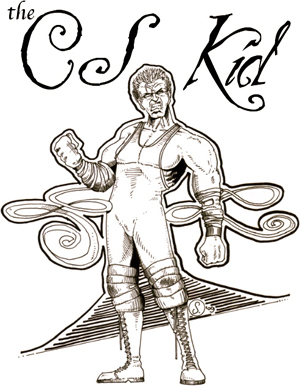 David Hodnett of Virginia is entering three of his DAL wrestlers into our Hall of Fame this cycle! Wyldsoul (1,177-177-34, $1,615,600), Omen (1,112-131-35, $1,377,400), and Malakai (1,092-132-38, $1,392,600) must all bid a final farewell to friend and foe alike. Omen would particularly like to give a shout out to Arsenal, whom he will remember as his most fun opponent, and tell him that he enjoyed every match and every drop of blood that was spilled. RWS/DFP: Duke Ken is also retiring this cycle. He built up a record of 2,191-414-54, and collected a total of $3,334,200 in imaginary earnings. His manager, Cody Behrend of Texas, will receive an engraved plaque for the occasion! ACE: The CS Kid (UFL) had an unstoppable 501-pointer last cycle, which he rode all the way to the game's top prize! The conquest gives manager Howie Sandberg of New York his fourth World Heavyweight title this year, and he makes IWA history in the process, as it is an unprecedented achievement. The victory also marks Howie's eighth World singles title overall. Incredible! "The Smoking Pope" Garett Guzman of Kansas armed TV champion (: Salvador Dali Lama (ABL) with a perfect 501-point strategy, and he used it to win this $60,000 title! Garett now gets his choice of an engraved plaque or 25 free matches. Adding up the values of hold positions 4, 5, 6, 9, 10, 11, 13, and 15 in the strategy of each battle royal winner led us straight to EDGE/NME: IWA's Number 1 Talent (MWL) and his 278 total (he had 501 points when counting all 15 holds). His manager, Steven J. Deane of Nebraska, wins the choice between an engraved plaque and 25 free matches! The league battle royals used hold positions 1, 2, 3, 7, 8, 9, 12, and 14. EDGE/NME: Rogue Warrior: Talon (ASL) relied on his 500-pointer to keep this championship belt around his waist, but had to resort to using point flow to turn back CTI: Faithful Misery (AAL). Talon's manager, Steven J. Deane of Nebraska, adds 10 free matches to his winnings! This $25,000 purse was awarded to 4REICH: Chico Violencia (JDL), who had a perfect strategy total of 501 points! His manager, Anthony Dudick of New York, will receive 10 free matches for the win. Anthony Dudick of New York picked up another 10 free matches by winning this title with 4REICH: Nazi Low Rider #1 (HWL), who had a 500-pointer! CTI: Vendetta (TDL) lost by point flow. Steven J. Deane of Nebraska helped EDGE/NME: Rogue Warrior: Talon (ASL) retain possession of this coveted title by providing a 500-point strategy! Since this is the fourth time in 2009 that this champion has hailed from the ASL, Steven wins twenty-five free matches. Simply outstanding! Reckless Rob Vicious (UEL) used his "Reckless Dive" to fend off Jason Litton of Louisiana's CFH: Allister Fiend (WEL), and earned himself $25,000 in imaginary money! He also won 10 free matches for his manager, Alan Pate of Illinois. Both wrestlers had 499-point strategies. Although SYNDICATE: B.K. Brawler (RSL) also had a 501 total, the CS Kid was able to keep the Iron Federation title within the confines of Howie Sandberg's New York war room. However, he gladly traded it in once a World Heavyweight opportunity presented itself. Howie also claimed the Bronze Federation honors, thanks to ACE: "Killer Shark" Kyle Havok (BWL) and his 500-pointer. In the Steel Federation, Rob Bream of Pennsylvania gave ILL: Luscious Larry Lawrence (PML) an unbeatable 500-point strategy of his own. EDGE/NME: IWA's Number 1 Talent (MWL) took the Gold Federation belt home to Steven J. Deane of Nebraska, who formulated his 501 total. Dennis Mooney of New Jersey pocketed 25 free matches by coaching SITH: Darth Avatar (NSL) to a stellar 501 points in the Diamond Federation. The Jade accolade went to 4REICH: Chico Violencia (JDL), who received a 501-pointer from New Yorker Anthony Dudick. Manager Paul C. Low of Maryland guided Raesta "Fire Scorpion" Guerrera (VVL) to a perfect score of 501 points last cycle, and she used it to great advantage. First she dominated the Ladies' World title play-offs, then added the Queen of the Ring crown to her resume. Finally, she helped Ryan Oskar of Ohio's "The Ugandan Goddess" Kamalana to a win in the battle for the Ladies' U.S. tag straps! LB: Lotus the Ninja Girl (VVL) picked up the $20,000 Ladies' U.S. championship for Frank Snow of North Carolina. She had to use point flow to defeat Daniele Donato. 4REICH: Lilith the Satanic Princess (LLL) was successful in her bid for the Ladies' National accolade. Manager Matt Yunick of New York supplied her 499-pointer. The Ladies' Tag-team titles went to ACE: Daniele Donato and Ice Queen Shannon Dragoo (LLL), who were led to victory over CTI: Lady Sugar and Lady Spice (VVL) by Tony Robinson of Florida. Both teams had 516 points. Tony added Diane Henry to the mix, and his team returned with the U.S. Six-woman belts! Not content with only the men's titles, Kevin Burr of Virginia set his sights on the World Six-woman honors, and won them when NME: Erica Mayhem, Tricia Horror, and Becca Death (VVL) overcame ACE: "Fatale" Dawn Destiny, "Ms. Inferno" Brook Blaze, and "The Ice Princess" Alexandria Snow (MDL)! Both teams had a perfect total of 521 points. ACE: Road Agent Rick Anderson and VP of Talent Virgil Riley (MPL) earned $25,000 apiece when Howie Sandberg coached them to these titles. The other half of the prize money went to (: Papa John and Uncle Dave (DAL), who belong to fellow New Yorker Tony Pesante! The top eight teams in the standings had 516 points. Howie Sandberg of New York secured these tag straps, as well! His team of ACE: Hitman's Wrath and "The Original ACE****" Howie Sandberg (MPL) had to use point flow to eliminate CTI: "The Thief" Gambit and Weapon X (IIL) from contention. Both teams had 516 points. NME: Private Hammer, Private Manson, and Private Payne (DIL) used military precision to gain this prize of an engraved plaque or 15 free matches for manager Kevin Burr of Virginia. Winning such a Major title is sure to earn them all promotions to Private First Class, if not Specialist! The top seven teams listed had 521 points. The team from the NDL was entered in the running for these belts due to an in-league mistake. Had it not been for this, the tenth team in the rankings would have been PAIN: Big Bad Texas Widowmaker, plus Texas Road Warriors Wolfgang and Hawkeye (CWL). John Durrani of Connecticut's team consisting of (: Thunder Lips, Youngblood Johnny Awesome, and the Punisher J.D. Storm (NBL) won these titles after being entered in the running due to an in-league error. They had to share the $20,000 purses with John's (: The Gladiator Erik and Mad Fist Michael Chambers, plus Comal County Blue (OSL), who is managed by Jonathan Akers of Texas. (: New Jack Terminator, Soul Glo Assassin, and Master Mang (LSL) also had 521 points, but were edged out. The most active leagues for the Dog Days cycle, going by the number of matches, are listed below. The Grim Reaper League held onto first place! Managers in the Xtreme Poison League can choose to take two matches for $1 next cycle, since their active wrestlers had the highest average strategy total out of all ten. The GRL placed second in the extremely competitive race.